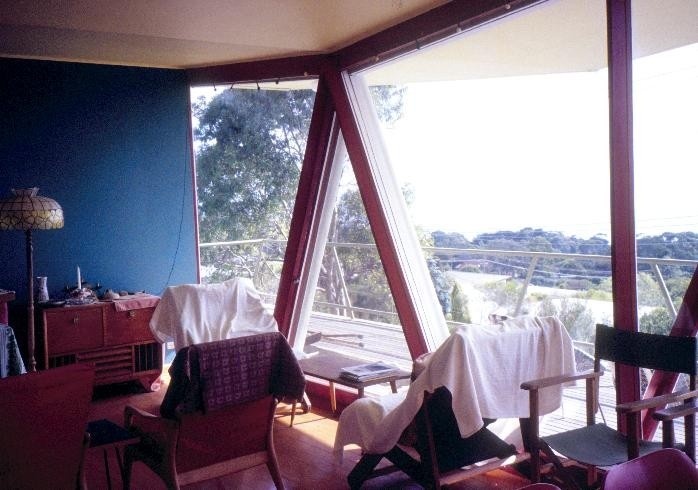 The McCraith house, constructed in 1955, for Ellen and Gerald McCraith was designed in the office of Mornington Peninsula architects Chancellor and Patrick. The defining structural feature is the triangulated tubular steel framing system. The building is constructed using two triangulated truss frames fixed at four points to the massive concrete footings on their inverted apex with 'C' section steel beams and steel cross bracing tying the main frame together. The two main steel floor beams break the truss at half height and these in turn support the deep timber floor joists which are cantilevered at either end. The butterfly roof is formed with timber joists in a similar configuration. The first floor extends beyond the small rectangular ground level, allowing for the parking of cars under the overhanging wings. Contained within the splayed walls of the ground floor are a bedroom and laundry area. The first floor contains a second bedroom, living area and amenities. 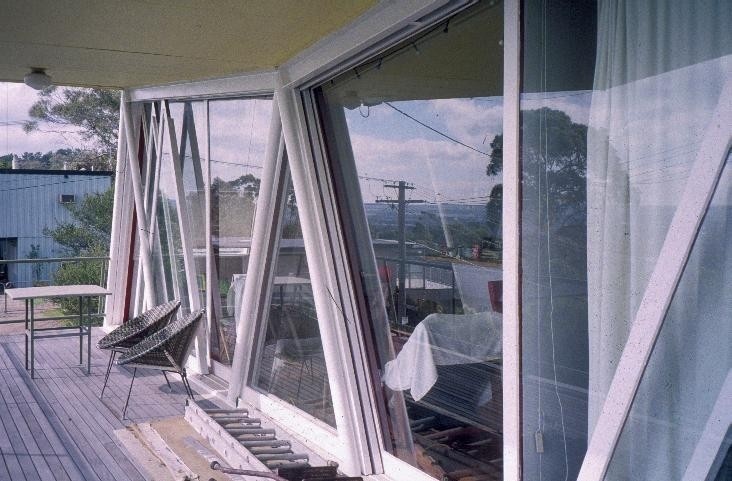 The dominance of the structural form forces the use of triangular awning windows at ground level with horizontal timber infill panelling between and timber framed triangular sliding doors to the balcony. The original horizontal board siding to the first floor angled walls has been replaced with sheet roof decking. The McCraith House is of architectural significance to the State of Victoria. 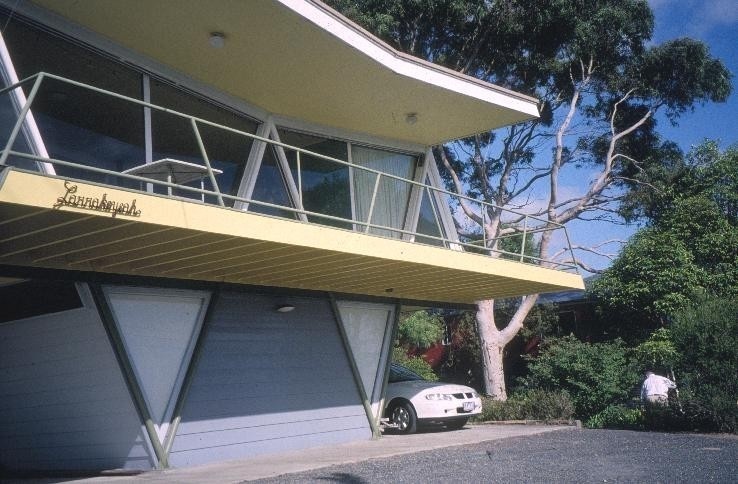 The McCraith House is architecturally significant as an example of structurally inspired modernism in Victoria in the 1950's. 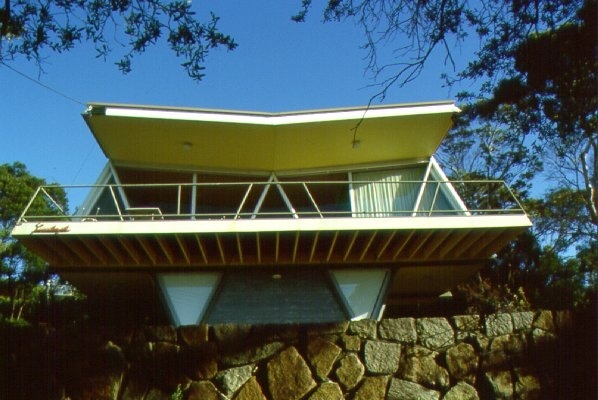 The McCraith house was used as an example of the 'structural functional' idiom in the architectural journals of the time alongside the works of Robin Boyd, Roy Grounds, Harry Seidler and Peter and Dione McIntyre. The use of a prefabricated structural steel frame of this scale was unusual in domestic construction of the period. The design of the McCraith house displays a creative architectural response in a period when conventional building materials were in limited supply post WW2. The McCraith house is also significant as a recognised contributor in the development of the Mornington Peninsula of a Regional style of housing. The McCraith house is representative of a change in the way society holidayed, influenced by the greater availability of the family car. The McCraith house is a small building embodying the ideas of structural experimentation, whimsical design, modern planning and the ideals of a 'holiday house'. Positioned precariously on a stone walled plinth, high above Dromana overlooking Port Phillip Bay, the McCraith house is distinguished by its unusual form creating a dramatic architectural statement. 1. 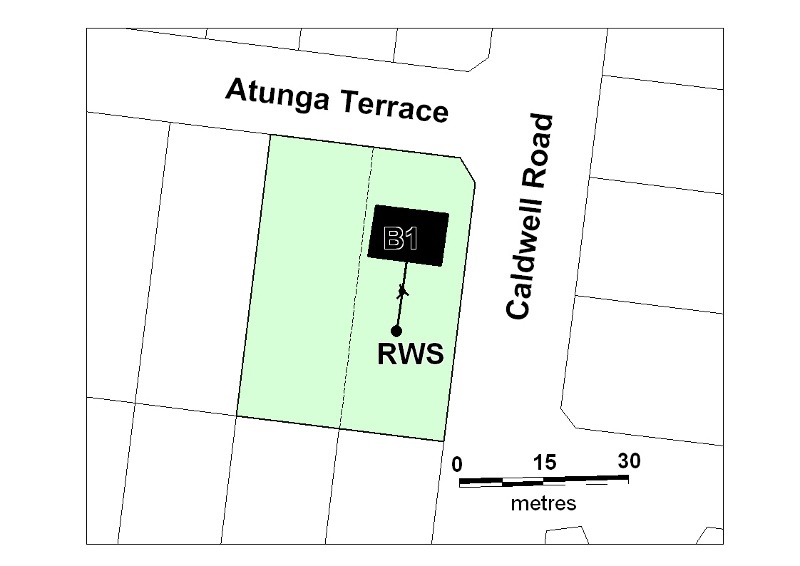 All the building marked B1and the rainwater system marked RWS shown on plan 1906 held by the Executive Director. The McCraith house at Dromana is of architectural significance as a representative of the type of seaside holiday houses that were gaining popularity in the mid twentieth century along the Mornington Peninsula. The Mornington Peninsula was regarded as an important area for growth in smaller scale holiday residences in the mid 20th century that are set apart from the Peninsula's tradition of grand holiday retreats from the late 19th and early 20th centuries. These houses represent a change for a greater part of the population to access inexpensive and permanent seaside holiday accommodation. 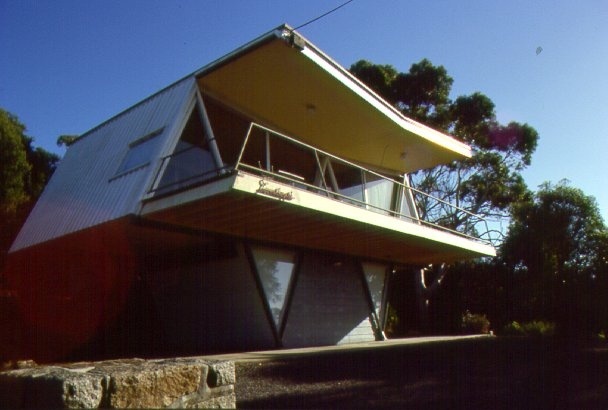 The McCraith house in Dromana is representative of a unique, innovative and distinguished architectural response to a holiday house design. 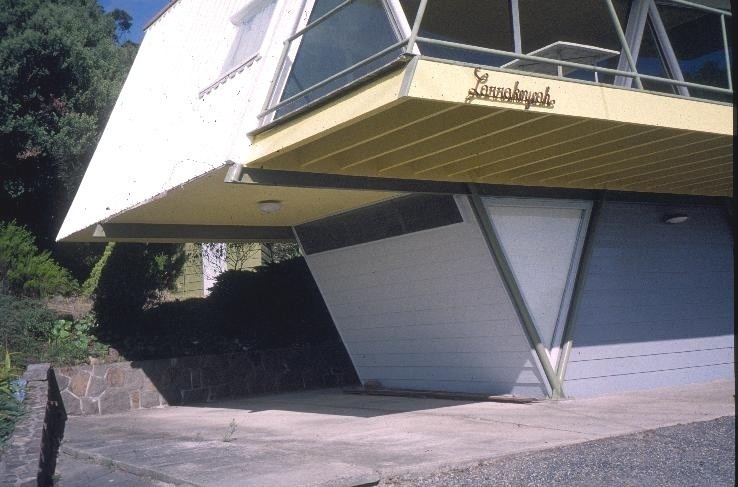 It is demonstrative of a shift toward experimentation with new forms and materials that was part of the structurally inspired modernist architecture developing in Victoria during the mid twentieth century. The McCraith house illustrates an understanding that holiday houses could be expressive and dramatic even when constructed using a limited materials palette. 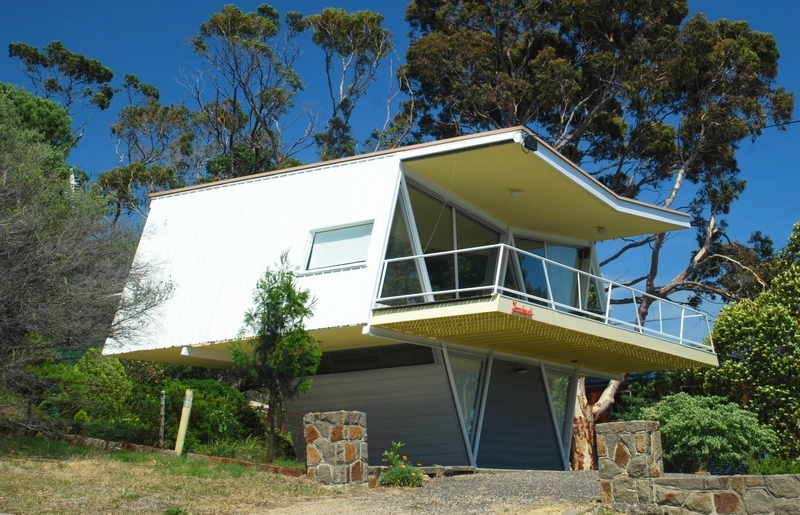 The McCraith house is complemented by its siting high above Port Phillip Bay, the integration of the building into the topography and the bush environment. * Repair of fences and gates. * Laying and repair of gravel toppings to the driveways. * Painting of previously painted walls and ceiling provided that preparation or painting does not remove evidence of the original painting or other decorative scheme. * Installation, removal or replacement of carpets and flexible floor coverings. * Installation, removal or replacement of kitchen benches, cupboards and fixtures including sinks, stoves, ovens refrigerators, etc and associated plumbing and wiring. * Refurbishment of existing bathrooms, toilets and including removal, installation or replacement of sanitary fixtures and associated piping, mirrors, wall and floor coverings. * Alteration to the top section of the timber frame to the sliding doors to facilitate removal for maintenance works to tracks. The purpose of the permit exemptions is to allow works that do not impact on the significance of the place to occur without the need for a permit. Alterations that impact on the significance of the exterior and interior are subject to permit applications. The cultural heritage significance of the McCraith house is principally due to its architectural style. The McCraith house is understood as a 'stand alone' structure and subsequently the construction of new buildings on the registered land would be subject to a permit application. The original light fittings and door furniture add to its significance as an intact example of the modern period.The window furnishings and sanitary fittings are designed to accomodate the splayed walls and are also contributory to its' significance.